League Two club Oxford United have reported financial losses of £2.4m in the 12 months to June last year. Chairman Darryl Eales, who holds a majority stake, said the figures were "in line with their expectations". "We had budgeted for such a loss, but poor performances on the pitch last season made it a little tougher than we had forecast," he said. Eales fronted a consortium who took control of the club in July 2014 from joint-owner and director Ian Lenagan. 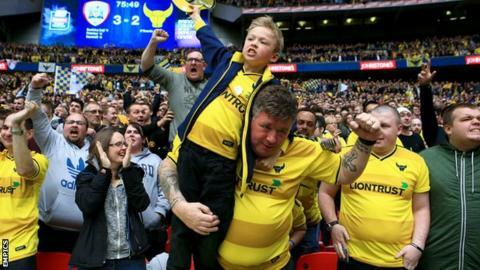 Oxford are currently challenging for automatic promotion from League Two in manager Michael Appleton's second season in charge and were runners-up in the Johnstone's Paint Trophy. The figures released do not include revenue generated from both the run to the Wembley final and to the fourth round of this season's FA Cup, which included home ties against Swansea City and Blackburn Rovers. "I'm absolutely delighted in how far the club has come in the past 12 months," Eales told BBC Radio Oxford. "The most important thing for me is that the fans concentrate on enjoying the football and don't worry about the finances. "This season, all three cup competitions generated revenue we weren't expecting, alongside television revenue, Wembley ticket sales, retail which we have brought in-house and gates due to performances on the pitch being on the up. "Even adding that all together, the club is still not sustainable. But, I don't think that at League Two or League One level that's achievable without some benefits of player trading. "Part of our model has been investing in recruitment and scouting, which is consistent on a sustainable basis." The club has also appointed Simon Kelner as a non-executive member of its board of directors. Kelner, a former editor of The Independent, has been assisting the club as a strategic communications adviser.